I went on a trip to Cebu and Bohol with my family. This is why I have not posted anything for the last 7 days. I will make up for it starting with photos from Plantation Bay that I took. The place was simply a dream. The beach, the pool, the ambiance, and the serenity of the surroundings justified the crazy amount of money that we spent for this vacation. The place looked like something plucked out of a postcard. My Mom loved it and we were all in awe. I couldn't believe the view that it presented us. 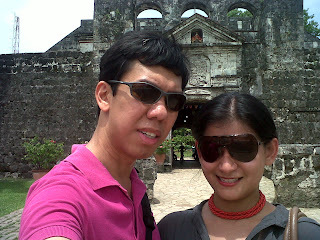 On our second day in Cebu, we decided to explore the beauty of Fort San Pedro. Fort San Pedro is a tourist spot in my hometown that I have never had the opportunity to visit. I was in awe when I saw the place. You see, I love Intramuros and to see Fort San Pedro which is kind of like Intramuros was such a joy for me. I loved the beauty of the place and the fact that there were only a few people inside. We took a lot of photos but they are with FM's camera so it will be months before we see those. LOL. We also got lucky that we were allowed inside this room since it was actually closed to the public for renovation. With a bit of prodding and charm, the caretaker allowed us in and it was a sight to behold. Inside this door were paintings depicting the turn of the Raja and his wife to Catholicism. Overall, we explored the place and took lots of photos. We even had some photoshoots that will be posted and blogged soon as FM is done with converting the files.Fort San Pedro lived up to its popularity as one of the main tourist spots of Cebu and it definitely did not disappoint.